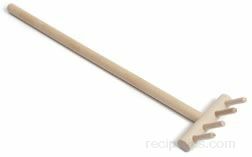 A utensil used when preparing and serving various types of strand, ribbon or noodle pasta. The fork is spoon-shaped with upward pointing pieces, either dowel-like or prong-shaped, separated around or on the fork and lifter tool. The pasta can then be dispersed through-out the pointed separations to be held in position as it is transferred from a serving dish to a plate. This utensil is also known as a pasta fork.